Sunday was such a nice day outside, we decided to go and do some gardening in the backyard. Over the winter, clovers started taking over the yard. In northern California, the weeds that tend to grow like crazy don't actually look like weeds at first. They look like clovers and after a while, they sprout such pretty yellow flowers. They aren't that ugly in general, but the problem is that they take over and block light and valuable nutrients and water from the other plants. We let the clovers grow a while, but decided that now was the time to rip them out since it would not rain for much longer here and the clovers were going to die soon anyways naturally. 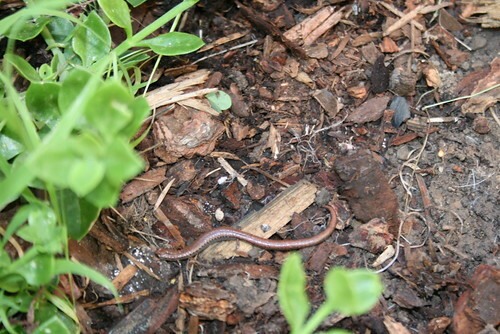 While we were gardening we discovered a salamander under a clay pot which had an evergreen bush in it. It was hiding out under the pot where it was cool and damp. The salamander was a California Slender Salamander, and during the winter, it is active and tunnels its way underground, sheltered in tunnels dug by other creatures like earthworms or termites. During the summer dry months, it hibernates. There is a special word for hibernation during the summer; it is called aestivation. It has no lungs, so it breathes through its skin. Oxygen is transported into the blood through diffusion into capillaries located close to the skin's surface instead of lungs. When I first moved the big clay pot, I thought it was a baby snake, but then it started to move and the head looked different and then I saw that it had four tiny tiny tiny legs! Romy tried to pick it up, but he couldn't catch it. It slithered away to another secret hiding spot. A California Slender Salamander in our backyard. 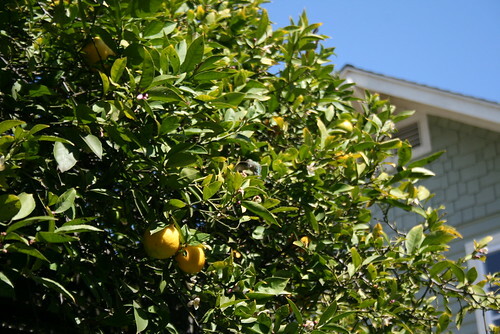 While we were out ripping clovers, we saw the hummingbird which visits regularly in the lemon tree. It is really tiny and has a metallic purplish blue coat of feathers. The wings beat so fast you can't see them, so it looks like a bird body with a long beak flying around and hovering from flower to flower in the tree. Depending on the species, the wings beat between 19-90 times per second, and they are the only bird that is able to fly backwards! It wasn't too afraid of us, because we walked up to it to get a better look and it just kept flying around looking for citrus flowers. A hummingbird visited the lemon tree in our backyard. It is hard to see the hummingbird, but it is exactly in the center of the picture. Click on the picture to see it better. Also, the poppy flowers we planted in October are growing big and the first poppy flower bloomed this past weekend. 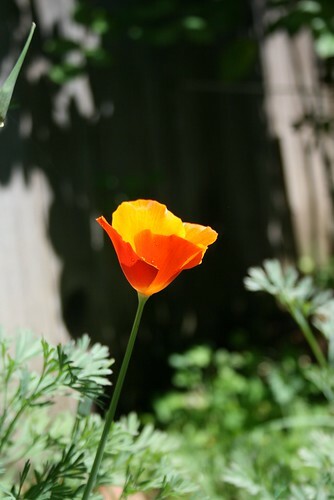 The seed package showed red poppies, but the poppy that bloomed was orange, like all of the wild ones you see growing everywhere here in California. Poppies are my favorite flower, so I was happy to see that they just started blooming! 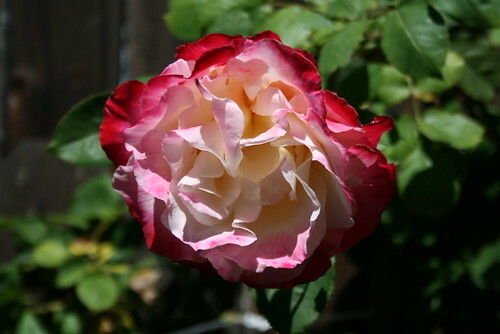 The two rose bushes in the backyard are also blooming like crazy. One of them bloomed a neon rose. The color is so intense, its almost luminescent! All the herb-y type plants are also very fragrant, so it seems as if the entire bay area is an herb garden. I regularly smell sage, rosemary, and bay leaf everyday in the air. Not to mention the fresh eucalyptus scent from the trees. The first poppy flower to bloom in our backyard. We planted the seeds back in October. 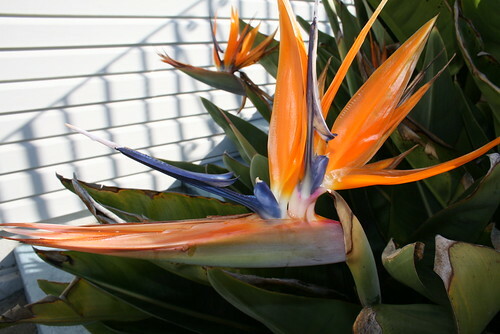 We also have bird-of-paradise flowers in the front of our duplex. They have been blooming all winter, during the rainy season.